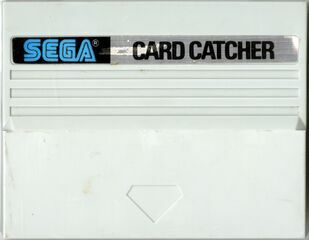 The Card Catcher is a special type of SG-1000 cartridge released in 1985. It acts as a passthrough device for Sega Cards (known as My Cards in Japan), so that they can be run on compatible systems that lack a card slot. The idea behind the Card Catcher was to distribute SG-1000 games on card rather than on cartridge to reduce production costs. Since the SG-1000 hardware lacked the connector necessary for the card format, a passthrough cartridge was needed for the new format. By the release of the Card Catcher, Sega ceased releasing SG-1000 titles on cartridge almost entirely. The Sega Mark III improved the internal hardware of the system but remained backwards compatible with SG-1000 and SG-1000 II. One of the major features of the new system was a card slot that could run SG-1000 cards, but the improved hardware meant that it could also run "Mark III Cards" - cards that were not compatible with earlier models but retained the original pinout and shape. When Japan received the redesigned Sega Master System, compatibility was identical to the Mark III. However, when the Sega Master System hit the western markets, the physical size and pinout of Master System cartridges were redesigned, possibly as a form of regional lockout, thus eliminating cartridge compatibility with the SG-1000. The card slot, however, remained intact, as Sega planned to keep using the same tactic of releasing smaller games on card and bigger games on cartridge. Towards the latter half of the decade however, new Master System games were considered too large for cards, which usually held about 32K of data. Only Sega supported the card format, and stopped releasing new games on Sega Cards/My Cards after 1987. When the redesigned Master System II was released in 1990, the card slot was omitted completely. The original Power Base Converter was the last piece of Sega hardware to contain a card slot. The Card Catcher has a Japanese-style shell, which means it will only physically fit within an SG-1000, SG-1000 II, Sega Mark III or Japanese Sega Master System. However, any card from any region can be inserted into the top and played. It is impossible to play a Mark III or SMS card on an SG-1000 system, however it is possible to run SG-1000 cards on a Mark III or Japanese SMS. Like the Power Base Converter, it contains no internal components, simply acting as a passthrough port. SG-1000 cards cannot be played on western systems however, as the BIOS contained in those systems looks for a header file which is not present on SG-1000 cards (as well as all non-western games), effectively preventing the play of these games. The Card Catcher was only sold in Japan and there is no official western equivalent as the card format was not considered a success. Card Catcher running a Sega Mark III card.